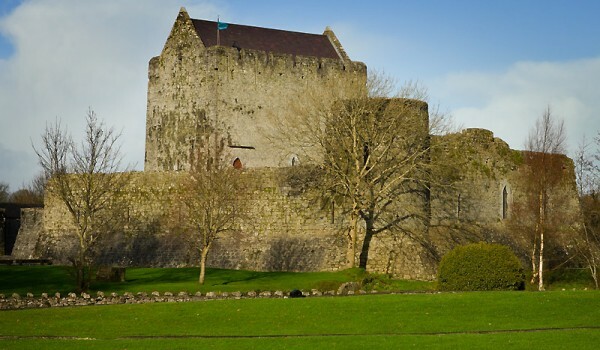 Athenry is one of the most notable medieval walled towns surviving in Ireland, owing its foundation to Meiler de Bermingham who built his castle there c.1250. The oldest part of the castle is the hall-keep. It is a large rectangular building originally containing only a hall at first-floor level and dark storerooms at ground level. For extra strength the lower part of the wall slopes out to form what is called a batter. The only original entrance was at first-floor level and would have been reached by an external wooden stairs similar to the present reconstruction. This gave direct access to the hall, the official and ceremonial reception room of the castle, where the lord received guests and tenants and presided over the manor court. Heat was probably provided originally by a brazier in the centre of the hall, with the smoke exiting through a louver or opening in the roof directly above. The garderobe or toilet is located diagonally across from the main entrance to the hall. transitional between Romanesque and Gothic. Dating from the late 12th and early 13th centuries, this style can be found at the abbeys of Cong, Ballintubber and Boyle. The battlements are original 13th century work with tall arrow loops or slits in the solid sections or merlons. In the 15th century, these parapets were incorporated into steeply pitched gables at the north and south ends, for a new roof at this level. Parts of the original enclosure wall of the castle survive. 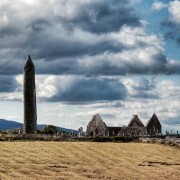 Take a custom tours Ireland with VIP Taxis and explore the west.